This article is part of our special report Electric Vehicles. Europe's cities are the main engines of economic growth, but personal vehicles continue to generate severe pollution and congestion despite efforts to reverse the trend, the European Commission warned as it launched its annual Mobility Week campaign and a new initiative on clean transport. Siim Kallas, the transport commissioner, used the backdrop of Mobility Week yesterday (18 September) to launch an initiative aimed at boosting research and investment in new transport technologies. "This new initiative will help our transport system to develop into an even more efficient, sustainable and user-friendly system to reach our mobility goals. It will impact positively on growth and jobs in Europe,” Kallas said. The initiative came as Mobility Week highlighted sustainable transport and alternatives to cars in cities across Europe. "It's a good time to look at mobility in cities to see what progress has been made," said Isabelle Durant, vice president of the European Parliament, at a public hearing yesterday (18 September). "There are a lot of cities in Europe that are not making progress. They have to get away from the city model they are stuck in, with a heritage dominated by cars, cars, cars," Durant said. Last year, the Commission has adopted a roadmap for the next decade, the White Paper on Transport, which aimed to build a cleaner transport system that increases mobility while supporting economic growth. The objective is to dramatically reduce Europe's dependence on imported oil and cut carbon emissions in transport by 60% by 2050. One of the Commission's goals is to remove oil-fuelled cars form European cities by mid-century. "It's time to start moving in the right direction. Moving towards a sustainable and efficient transport system will help enhance mobility and at the same time reduce pollution and improve the quality of life in cities," said Janez Poto?nik, the EU environment commissioner. "Better planning can help cities benefit from greater mobility as well as better air quality, reduced emissions, less noise and a healthier urban environment," he said. The Commission has called for a "necessary" transition from primarily car-based personal mobility in cities to a mobility based on walking and cycling, high quality public transport and electric passenger vehicles as the central strategic challenge for cities in decades to come. The Commission's White Paper on Transport argues that clean urban transport can also be achieved by using "the use of smaller, lighter and more specialised road passenger vehicles", like motorcycles. As part of Mobility Week, there was an exhibit on the esplanade of the European Parliament in Brussels of bicycles, electric cycles, scooters and motorcycles, particularly suited for urban transport took place. Lucien-André Beckers, the general manager of Electroads, a company that sells electric bikes, was among those at the exhibit. One product, a pedelec, provides an electric boost when pedalling uphill. The rider can also use the bike's electric battery to go faster. The battery recharges going downhill. A pedelec's battery needs to be recharged after 100 kilometres. Recharging the battery to its maximum capacity costs around 50 cents, Beckers said. "If you go to work on this, you never sweat," Beckers told EURACTIV, adding that he would also recommend it to older people who might have health problems but need a bit of exercise. "Personally, I ride a normal bike, but from time to time I like to use my electric bike when I go to the woods," Beckers said. 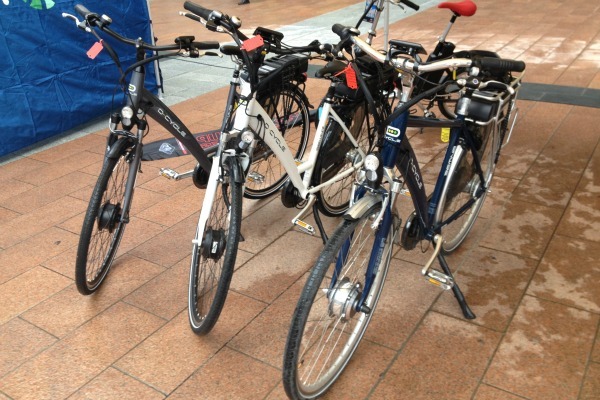 He added, that though the pedelecs are not as green as regular bikes, the pedelecs and the battery are recyclable. Referring to Mobility Week, Kallas said: "While responding to the challenge to make our cities cleaner and safer, we have to find the right balance for our daily travel needs. We dislike traffic congestion, noise and pollution, and we are aware of the risk of road accidents, but quite often our good intentions do not translate into sustainable mobility." "This is why European Mobility Week supports the development of pedestrian areas and cycle infrastructure, the improvement of public transport, and brings together local communities. This year's focus on Sustainable Urban Mobility Plans calls on towns and cities to join us in making the right choices for public transport, shared road space and fluid passage for everyone," Kallas added. The European Green Party said in a statement: "The increase in CO2 emissions from transport now accounts for almost 30% of all EU emissions. A growing dependency on oil has become a defining characteristic of the EU economy, with the explosive growth in road and air transport responsible for 70% of the EU's oil consumption. Transport must be a key focus if we are to have any chance of reducing this dangerous dependency on imported oil and tackling climate change, as well as avoiding a future energy supply crisis." Jacques Compagne, secretary-general of ACEM, the Motorcycle Industry in Europe, said: "The European Mobility Week is a great opportunity to 'think outside the four-wheeled box' when it comes to the way we move in our cities. Alternatives to car-based urban individual mobility exist, and all of these should be conveyed to the public. However, all too often the benefits of motorcycles and scooters go unnoticed, despite the fact that a growing proportion of citizens use them on a daily basis." European Mobility Week is an annual campaign on sustainable urban mobility, organised with the political and financial support of Directorates-General for the Environment and Transport of the European Commission. Since its introduction in 2002, the impact of European Mobility Week has been steadily growing, both across Europe and around the world. In 2011, a record number of 2,268 cities, representing approximately 156 million people, registered for the campaign. 16-22 Sept. 2012: European Mobility Week.